The October 2018 release introduces several new features aimed at helping you to gather more detailed feedback from your customers, better moderation control and new ways to automate your marketing campaigns. Have an idea for a new feature or integration? click here to let us know. This feature allows you to ask custom questions during the review process to gather detailed & personalized feedback from your customers. Custom Forms are based on tags assigned to products, this way you can create as many custom forms as you like, and capture specific detailed feedback over certain types of products. Example: As a clothing company you may want to ask the customer "How well did the shirt fit?" with our Fit question type, allowing the customer to tell you exactly how it fit them: "Runs Small, Fits Great, Runs Big". 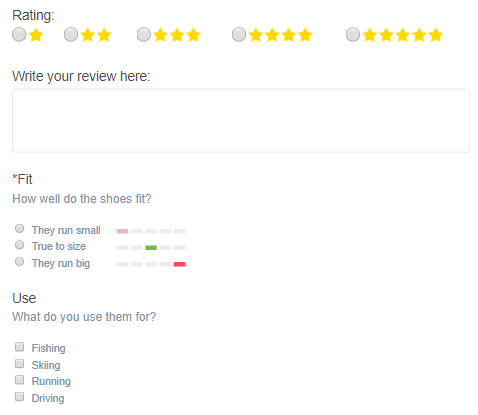 To learn more about Custom Review Forms, check out our support guide. To learn more about the Klaviyo Integration, check out our support guide. We completely revamped our Review Widget settings page, now giving you greater control over the design of your Review Widget, including full Custom CSS control. Previously, CSS changes had to be made on your site directly, today they can be added into your TrustSpot account. 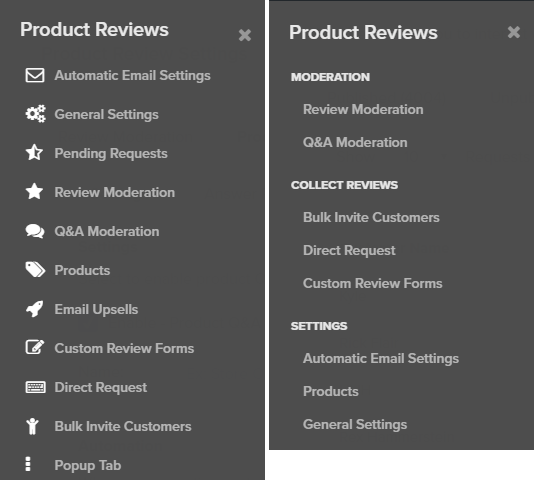 To learn more on how to customize the review widget, check out our support guide. This feature now allows you to customize the from name associated with all answers to questions. Currently all answer names show as your Company Name, today you can change that to any name you like, for example: "Store Owner" or "Product Expert"
In 2018, we've released dozens of new features which was causing our menus to become a bit cluttered. We took a step back and re-organized content based on sub-categories and also their usage. For example, Moderation pages are checked daily, whereas General Settings maybe once a month, so we wanted to push items that were used more to the top. Our goal is to transition all platform screens to this new menu by December 2018. With every platform release, we not only focus on introducing new features but also improvements to existing items within the platform. Based on feedback, we're happy to detail out the miscellaneous improvements made to the platform in October. Our November release will be focused on introducing new ways to communicate with customers, in addition to displaying content on your site. There are also a few new integrations we're looking forward to launching.